Brandon Heath Tsung, a modern age slick thug with a righteous mind and a whole lot of bad temper was to be known as one of the head leaders of the Black Hand Triads one day. He's actually one of the classic triads in Los Santos, putting aside that he's an american boy with no asian origin whatsoever that was picked up off the streets by Milo Tsung when he was 16. Milo Tsung came to adopt Brandon and eventually introduced him to the Black Hand Triads, where he would climb through the ranks of that which was a secret society for years till he one day became the head of the Black Hand. and decided it was time to leave in exile. Brandon told his associates that he was stepping down as the head of the Black Hand and disappeared after being attacked by those who had plotted against him. Brandon set out in hopes of finding a new perspective on how the world as he knows it really looked like, so he set out to work as a lone wolf under different names for many of the Black Hand Triads past rivals out of curiousty. He eventually met up with one of the triad elders that had retired from the Black Hand long ago, he was called Diango Thompson. Diango had just gotten back to Los Santos and saught to unite all crime and it's many resources to one big underground center called the Mercury Company. Brandon joined up with Diango and they wanted to use the influence the Black Hand Triads had on Los Santos, so they went back to the Black Hand, hoping that they'd be welcome back. It was during this time, one of Brandon's former associates had become the head of the Black Hand Triads, Achilles Tsao. Brandon knew that Achilles would take his place when he disappeared, but what he didn't know was that Hector Sabe was running the Black Hand alongside him. Hector Sabe, the one who had plotted against Brandon from the very beginning was now a Shan Chu. Brandon told Diango about Hector and in short, there was a minor dispute between Brandon and the Black Hand Triads that was just enough to start some kind of internal war in chinatown. The whole situation had become a mess, and it was Brandon and Diango against the whole world it seemed. However, during the time Brandon had been gone working as a lone wolf he had gained much influence over the city of Los Santos and was able to bring in people to work as mercenaries for what they now officially called the Mercury Company. And so it began, Brandon and Diango was now responsible for a war in chinatown and there was carbombs and dead people dumped in the containers meant for trash and the police raiding apartments everywhere in the once quiet chinatown. After months of war, they had all finally come to their senses. Achilles and Hector were tired of it all and allowed Brandon and Diango to finally merge with the Black Hand. Brandon and Diango joined the ranks of the Black Hand and climbed themselves all the way back to their former positions with the Mercury Company running most of the criminal business in the Black Hand. They had now achieved victory in a sense of it all, they were now once again respected triads throughout Los Santos. But Brandon wasn't satisfied with just being a respectable triad. he wanted more. So Brandon started plotting against Hector Sabe, the devil who once plotted against him and waited patiently for Hector to grow fat and tired till the day he would resign from his seat in the Black Hand Triads. When Hector resigned from his seat, Brandon saw his chance and disposed of him in the dark and eventually claimed the title of Shan Chu once again and all whom were loyal to Hector disappeared after one night. Brandon Heath Tsung with Diango on his side was now running the Black Hand Triads alongside Achilles. Years passed and Diango disappeared, Brandon was now an outstanding leader of the Black Hand Triads once again and Achilles was most of the time out of the country doing business in Hong Kong. Brandon controlled everything that was going on in chinatown and he had gained very loyal and trustworthy Fu Shan's by the name's Yugo Ogami, Brock Lesnar, Fred Fu, Sarko Correz and Sima Matsumi. The Black Hand Triads was now one of the largest crime syndicates in Los Santos once again and invested in every rival gang except for the many lesser street gangs of Los Santos. While Brandon was in control of the Black Hand Triads he had totally forgotten about the Mercury Company that he and Diango had strived for to become the center of all criminality in Los Santos. So he started investing money on the Mercury Company for the future in secret and started keeping files on people that he thought would be appropriate recruits for the company if he one day would need them. The Mercury Company now has a bunch of secret estates throughout Los Santos and people that are secretely working for it and controlling minor crimes throughout San Andreas. Brandon was satisfied with his progress in both the Black Hand Triads and the Mercury Company that had now unknowingly spread it's business and services in secret around Los Santos. He resigned his position in the Black Hand Triads and left for some time. After a few months of being gone, a new year has come to light and Brandon is thinking of making a comeback with the Mercury Company, but first he needed his loyal companions. I'm an R5 Ranger in hzrp. 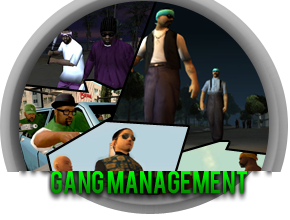 Please wait for Gang Management to create the slot In-game. Applications has been settled, Look for Mustang in-game and he will handle it.